It’s true. Temari is addicting. I haven’t discovered yet if it is addicting as a craft – I don’t know, for example, whether or not I’ll be desperate to start another one once I finish my first attempt, because I haven’t finished my first attempt yet – but I do know that, in the process of creating one ball, it is addicting. I didn’t want to stop. And my First Attempt Temari is ugly. And I still didn’t want to stop! Yesterday, the itch to try to make a Temari ball finally overcame me, and in the later afternoon when I should have been doing a dozen other things, I slunk out to the studio, furtively planning to to give in. The first thing I had to do was gather threads. Never start a project until you have at least a goodly bit of the supplies actually in your possession. I know this rule, but I really had to make a Temari ball yesterday afternoon! I had some partial skeins of DMC perle cotton #5 leftover from the kids’ embroidery classes I taught last summer. Let’s see… a pink, a light blue, a very little bit of dark blue, and a rather vibrant yellow. There was also a skein of bright orange, but that didn’t seem to fit the bill, quite. Sticking with an overall baby-colored scheme, then (with the exception of the yellow, which was too bright to be baby), I launched into embroidering the outside of one of my thread-wrapped balls from Lacis. 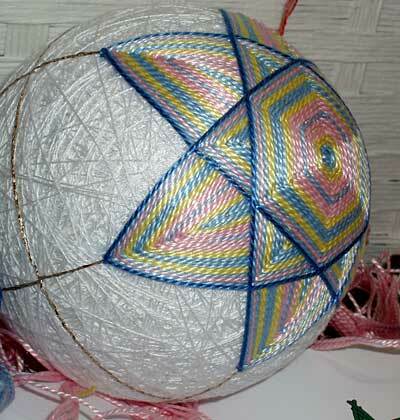 The ball was already divided into a simple 6 division, so I found, in Barb Suess’s book Japanese Temari, A Colorful Spin on an Ancient Craft, a pattern for a six division ball and launched in. I wasn’t sure of the needle to use, so at first, I started out with a regular crewel needle (#3), but quickly switched to the only large darning needle that I had in my needle box. I have no idea what size it is, but it was the longest needle I had, so I stuck with that. It isn’t exactly my favorite design that I’ve seen on Temari balls. So many of these embroidered spheres have caught my eye lately, but this particular design didn’t, exactly. Still, it was a six-division pattern and looked fairly simple (which it was). Because the ball I had was so huge, I had to add extra rows of thread, so I expanded the original pattern a little bit. My spacing and tension were not exactly what they should have been. I found I crammed the stitches into the end-points, instead of keeping them a bit farther apart and well-spaced. This caused some of the threads to bunch up against each other, and, in some cases, to overlap, covering up other threads. Some of the little arms of the “star” came out better than others, but there’s still a tension and spacing problem going on here. 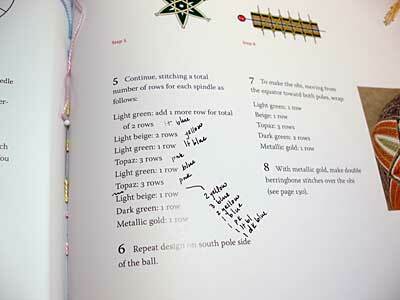 As I altered the pattern a bit, I jotted down the alterations in the book. Yes, I write in my books. Not in all my books, but in many of them! Barb Suess’s book is really excellent for beginners. I recommend it highly! The other book I ordered was Temari: How to Make Japanese Thread Balls, by Diana Vandervoort. Once I got the hang of what I was doing, I liked the second book, too. It’s not as nice a book, though, as Barb Suess’s, if you’re one who judges content by appearance. The pages are that rough news-printy type paper, and, except for a couple pages right in front, there is no color throughout the book. All the diagrams look hand-sketched. But the information is really good, and there are some neat designs in there, though you don’t get to see them displayed in color. As far as the pre-wrapped ball from Lacis goes, by the way, I find them rather large. I don’t know if this is the standard size, but it “just” fits in my hand – it’s like a softball. It feels large. I can see why making your own thread-wrapped core would be more enticing, since you can then determine the size of the finished product. I’m eager to finish this ball. Once I see it completed, I’ll know better if I want to invest in some specific threads for the black core. Anyway, that’s it – my First Attempt Temari. July 10, 2009 Temari, Anyone? Why, why. Why must you make things look so wonderful and easy. I just can't afford another indulgence. No really, your first attempt looks marvelous. Yes, you do have some overlapping threads, but just look at how much is perfect! It's eye candy to me. Isn't it fun? 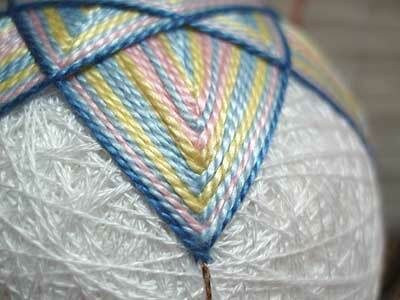 You do have to stretch your points and the problem of bunching up threads will take care of itself. Your first attempt is very pretty. Are you going to do the same pattern on the other side? Told you it was a good book. 🙂 Many thanks to Barb Suess for answering my question on your previous Temari post, I will be sure to do that next time I'm making cores. I guess the theory is that bigger Temari are easier to work. I've been using 3" foam balls as a core, wrapped in yarn and then the surface thread. The end result is one size smaller than a softball (yes, I just jumped up and did a comparison! ), and is about as large as I can hold and work comfortably. I have larger-than-average hands though, so your mileage may vary. Congrats on your first Temari! I don't think it's all that ugly. 🙂 And yes, the spacing does takes practice. Have fun! This looks wonderfully addicting (especially if your first attempt is coming out so beautifully). I can see why it might be a bit uncomfortable if it's as large as a softball. A smaller size would be easier to deal with. I can just imagine it squirting out of your hand and rolling under the furniture! 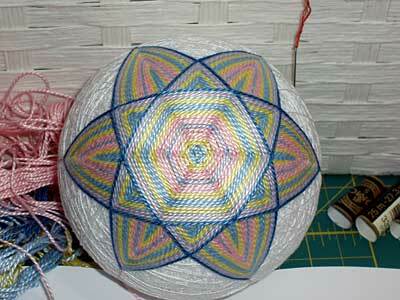 I knew a woman who made wonderfully spectacular Temari, but she made little ones – about 3 inches in diameter. A basket of these lovelies made anyone who saw them covet them or want to make them. If I remember correctly, she used to enjoy making the balls from scratch – kind of a mindless, in front of the t.v. activity. Aren't we a funny lot … anything to do with thread and needle will send us into a swoon. I love the colours, a beautiful temari! Well done! Looking forward to seeing it completed. Well, I think it's just lovely! 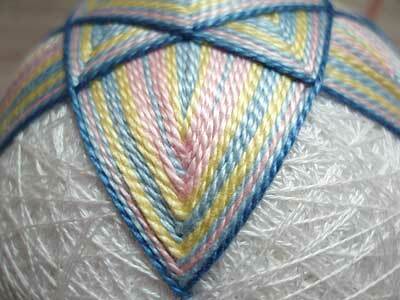 The colors are so pretty and the shine of the perle cotton is … uh … shiny! Kind of reminds me of the perle cotton wrapped Easter eggs I made a few years ago, only your project is much more involved and so much prettier! Your first attempt looks lovely and very tempting for us readers to try. Boy, picky one, ain'tcha? I know MY first attempt, if I ever manage to make one, will look absolutely horrid. Tufts of cat/dog hair, shredded threads….yours looks like you laid it all out flat and then GLUED that sucker on! Go easier on yourself; you're having fun and learning at the same time–a great way to go. Here's a thought, though…why not use the small tennis balls from the dollar store for centers? How pretty, Mary. Can't wait to see the finished product! But please, don't tempt me to take up another project!! Wow! Is that your first attempt? Very nice. Spindles take some practice to get the spacing right. Previous comment about spacing them out to avoid bunching is right on. You probably figured that out already! For me it's perfect, Mary! Lovely! I think it's really pretty so far. And now you know about the tension at the points, you'll be ok.
Next Next post: Schwalm Embroidery – The Definitive Guide!